Shouldn't that car have been taken care of with the "Cash for Clunkers" program? How's that Pontiac brand working out for ya? Isn't that symbol part of the Mayan long count calendar? And the better hack of that sticker seen at a link at Instapundit a couple of days ago. Our friend Trochilus has an amazing new product out that will cover up that stain in no time. LukeHandCool (who, unlike the Professor and his tongue-in-cheek exhortations to drive safely when we have a country to save, does urge people to respect political opponents' private property). I saw one of those in the Bay Area. IIRC there were more Obama stickers around at this point in 07. 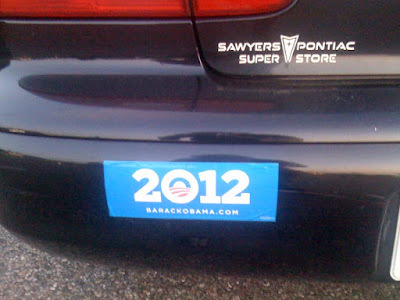 In fact, there is plenty Obama 08 stickers still. "In fact, there is plenty Obama 08 stickers still." Well, acording to Obama it is still 2008. Maybe they're just stuck in time with him. What in the name of "God's Holy Trousers" has gone on these past four years anyone wants four more years of?